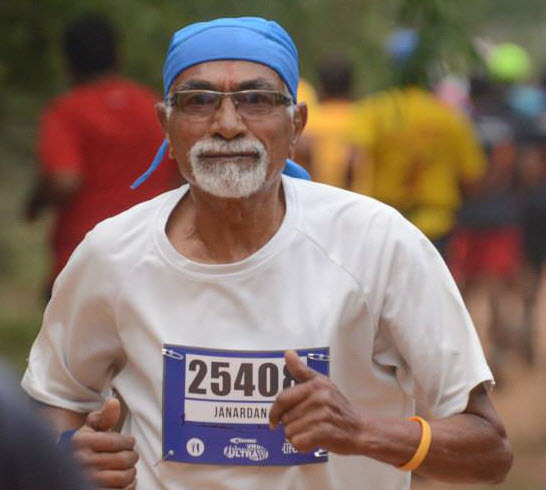 Dreamer #3: The 82-year old cyclist, trekker and runner – Bylahalli Janardan. March, 1995. Bylahalli Janardan couldn’t believe what he was hearing. He was sitting in the doctor’s cabin and had just been told he has Epilepsy. In a flash, he saw how the rest of his life could be – Unpredictable seizures, Lifetime medication, and the probable need for round-the-clock care. He didn’t understand it. He couldn’t accept it. Even when he asked, “Why?”, all he was told was that it ‘happens’. Circa 2014. As Mr. Janardan walks into my house, he asks “Do you have a hard-plastic chair?” I immediately assume that he requires it for an issue he may have with his back. He seems to read my mind and instead says, “I don’t like to sit on sofas. 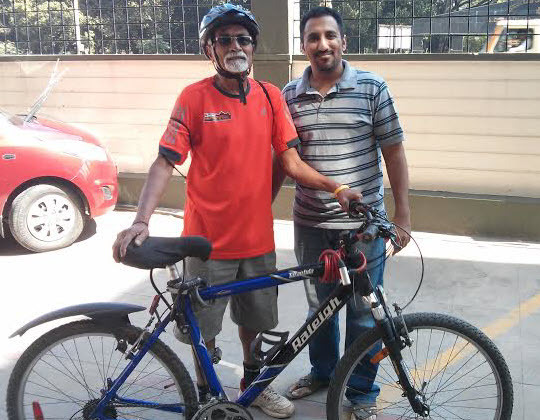 How will I prepare myself for all the difficulties I’ll face on my cycling routes and treks?” I give Mr. Janardan a plastic chair, itching to turn my recorder on, realising that we had already begun our conversation – even if he didn’t know it. I sit there, surprised that he even needs an excuse. He now cycles an average of 19,000 kilometres a year, treks across the Himalayas and runs several marathons. He is 82 years old. How did this happen? How do you go from being diagnosed with Epilepsy to this point? More importantly, how do you achieve all this running on 82? It all started 20 years ago. Bylahalli Janardan was living the quintessential retired life. His children had completed their studies, and he was busy focussing on a newfound hobby – gardening. One day, he was travelling in a car with his wife & relatives, when he suddenly fainted. His family immediately took him to a nursing home nearby, very concerned and worried. He slowly began to revive with medical care. Mr. Janardan did not know what to think of this. Initally, the cause of the incident was not clear and this was much more disconcerting. Upon further diagnosis, the doctors concluded that he had Epilepsy, an incurable nerve-based disorder in the brain. “I was told that I had to live on medication my entire life. My body was never used to any kind of medication.” His family, as expected, were very concerned. Mr. Janardan refused to accept this. He had always lived a very active, vibrant life. The thought of letting that side go was too much for him to bear. No matter how many specialists he visited, he refused to believe it. Eventually, bowing down to family pressure, he started his course of medicines. “I started feeling very uneasy whenever I took the tablets.” He was slowly beginning to move to a life where he could no longer be his former, active self. He also had to be constantly watched if anything untoward were to happen. Despite all these lifestyle changes, he could not come to terms with his situation, no matter how hard he tried. The day had come where he had to test his assumption – “No matter what people told me, I was convinced I didn’t have epilepsy”. One night, he quietly stepped out for a long walk. He would continue to do this for several days. These walks began to strengthen his belief that he was not under the risk of an epileptic attack, even though there was no medical proof to arrive at such a conclusion. These experiments would slowly lead him to discovering his passion. “One day, my boy, who plays the Sitar, was selected by his University for a cultural event. The competition was to take place 30 KM from my home. I was obviously not going to miss my son’s performance”. He remembered the cycle he bought for his son soon after retirement. December 24th, 1996 was the day it all changed. 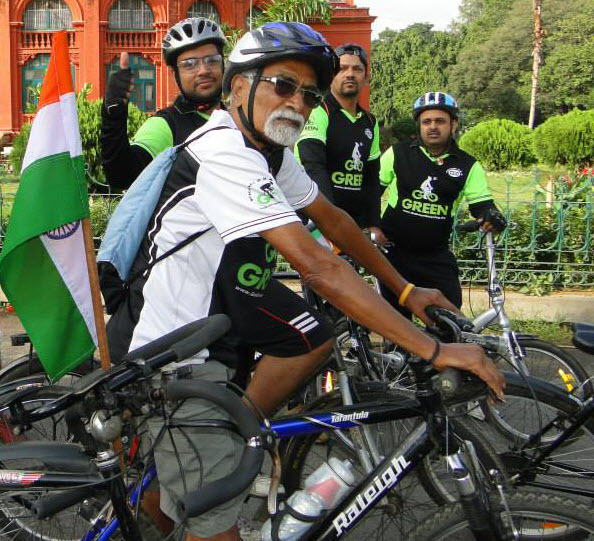 He decided to cycle the 30-kilometre stretch to Devanahalli in Bangalore. “It was the first time I had touched a cycle in 40 years.. but I really HAD to know if I was suffering from something or not”. He returned the next day with a pit-stop, having cycled 77 kilometres in total. This was it – the start of a new endeavour. He discovered his love for cycling. Despite his gritty attitude, Mr Janardan was not spared of his share of perils during his journeys. He had even experienced two situations where his life was possibly in jeopardy. One time, he was being guided by a local on one of his expeditions. After helping him up the rock, the man pulled out a knife and demanded that all his money be handed over. “No amount of coaxing would shake that person”. Suddenly, Mr. Janardan had a thought – he decided to risk damaging his camera. He grabbed his equipment and quickly smacked the thief across the face. As soon as he did this, he slid down the rocks and made a break for his escape. However, the second incident was far more serious. On a lonely stretch, where he made a pit-stop while cycling, four miscreants grabbed him by the arms and legs and moved him to an area where no one was to be seen. They covered his mouth and held his neck to ensure that he would not scream. Unfortunately for the thieves, all the money had fallen out of his pocket while he was being carried away. One of the four got so frustrated at finding nothing that he grabbed a boulder and threatened to throw it on Mr. Janardan’s head if he didn’t part with his belongings. His only response to the threat was, “Do what you want. I will take the name of the Lord and let it be.” The man finally threw the boulder aside and ran away. Janardan’s never-say-die attitude and perseverance has allowed him to cover 346,000 kilometres on his cycle in the last 18 years. 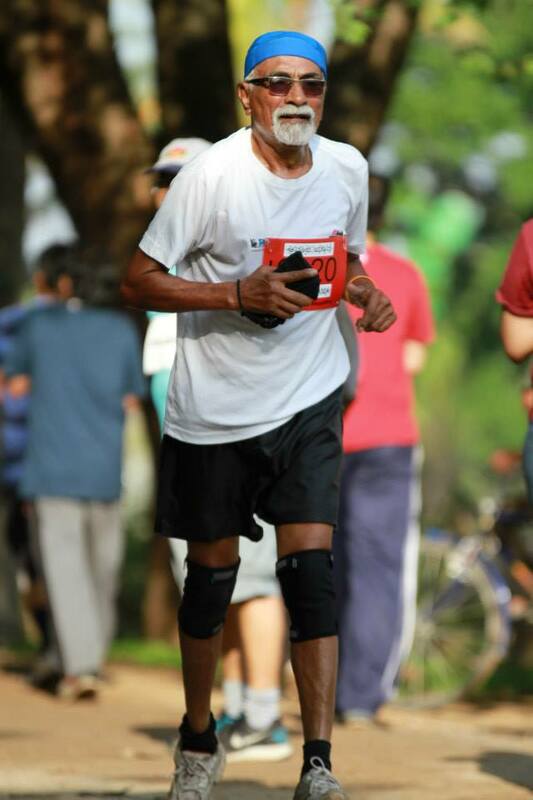 He has completed 18 treks in the Himalayas and has run 5 full-marathons in addition to several half-marathons. “I want to travel from the Earth to the farthest side of the moon. This is my one, main goal,” he says. This is close to 400,000 kilometres and he isn’t far off. 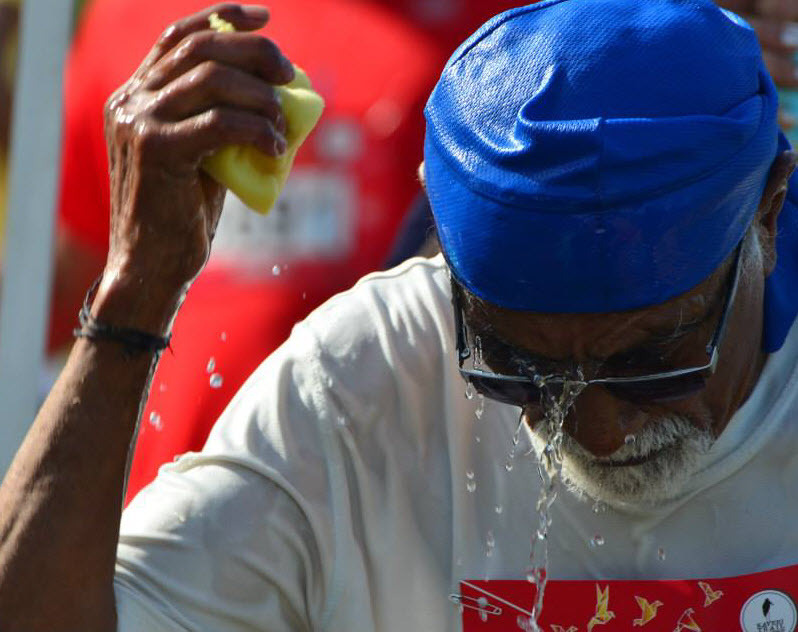 We reach the end of our conversation, but there is one thing I can’t get out of my head – How is he able to live such an active lifestyle at his age? How does he keep going?